1st October, Taichung: A total of fourteen teams from eight countries paraded at the opening ceremony of the 19th Asian School Tenpin Bowling Championships hosted for the first time by Chinese Taipei in Da Chung Bowling Centre, Taichung City. The ceremony was graced by Mr Fang Pin Kuan, Deputy Director General, Department of Sports, Taichung City, in the company of Mr Wu Fu-Lung, President of Chinese Taipei Bowling Association and Ms Liu Pei Chun, Section Chief, Department of Education, Taichung City. Also present were distinguished guests - Mr Alex Lim, Hon. Treasurer of Philippine Bowling Federation and Asian Bowling Federation Executive Board Member, Mr Winston Chan, Vice President of Macau-China Bowling Assocation and ABF Hon. Auditor and Dr Danny Santos, Tournament Director. Ms Carol Liao, emcee for the ceremony welcomed all present and kicked off proceedings with the introduction of the members at the head table and distinguished representations of the ABF member federations before announcing the march past of the eight participating countries. 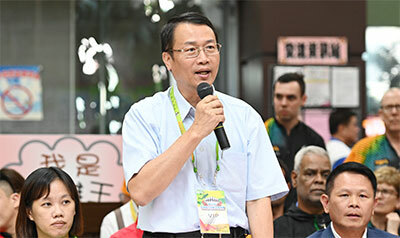 Mr Wu, who is also the co-organising chairman, welcomed guests and participants and officials to the 19th edition of the Asian School Tenpin Bowling Championships. He thanked the federations in supporting the championships by send their teams to Taichung City. He also expressed his gratitude to the support from the Mayor of Taichung City, the Department of Sports, Taichung City, the Department of Education, Taichung City and various sponsors and partners. This was followed by the speech from Mr Fang Pin Kuan during which he thanked Asian Bowling Federation and the Chinese Taipei Bowling Assocation for bringing the championships to the city of Taichung for the first time. He wished all the players and teams the best of luck and encouraged all to find time off their busy competition schedule to visit the city of Taichung before leaving home after the championships ends. Ms Yang Shih-Yu and Mr Lai Wen-Xian, members of the Chinese Taipei team, took the athletes oath on behalf of all the players while Ms Wang Ting-Wen took the oath on behalf of all the volunteers officiating the championships. 56 boys, 40 girls and 28 team officials have been registered for this championship. Four events will be contested comprising of Singles, Doubles, Team of Four and Masters. The top 16 boys and top 16 girls in the All Events standings after 18 games played will qualify for the Round-Robin Matchplay Masters finals to be held over two blocks of eight games each.